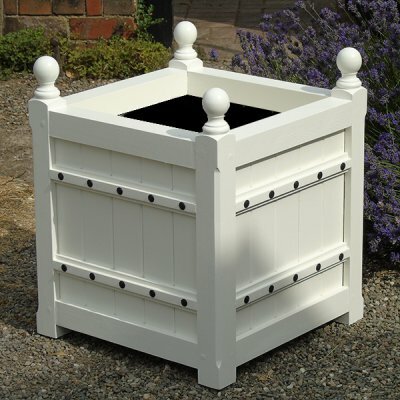 Peplow wooden garden planters are attractive and solidly constructed planters. All the timbers are substantial and it has attractive finials atop each corner post with black stainless steel coach bolts through horizontal straps and side walls. It is suitable for a large seasonal planting display, or shrub. It looks particularly good with a really large palm or fern style plant. 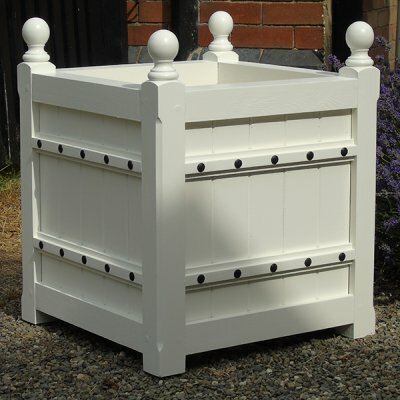 The Peplow garden planter is constructed with Scandinavian red pine with the internal surface of the planter finished with a thick waterproof paint sealant. Growing shrubs in planters is no different from growing them in the ground. Growing requirements are typically the same; however, regular watering and fertilizing is more important in order to maintain healthy growth. Also, planters should always provide good drainage. Shrubs in planters should be thoroughly soaked and allowed to become dry to the touch before more water is added and unless you plant the shrubs in a large planter initially the shrubs may have to be replanted in a larger planter after a while or, if by pruning the roots, they can be replaced in the same one. Pruning the roots prevents shrubs from becoming too large for their current planter. It also freshens up the soil and prevents the shrubs from becoming root bound. Slow growing shrubs are an excellent choice for a planter. Nothing is more beautiful than an azalea in spring. These easy-care shrubs come in so many colours it’s hard to find one that doesn’t appeal. Growing and caring for these shrubs is easy. These shrubs should be planted in the spring, preferably in a cool, lightly shaded area. Full sun can actually burn the leaves while heavy shade can deprive them of necessary oxygen, resulting in poor blooming and weaker growth. Azaleas have shallow roots and require a well-drained, acidic soil. Hence, Azaleas are well suited for planters. To maintain a more compact appearance or simply to encourage bushier growth, trim azaleas after their flowering season by cutting back the branches. This will also help renew overgrown plants. With care azaleas will give you many years of beautiful flowers.